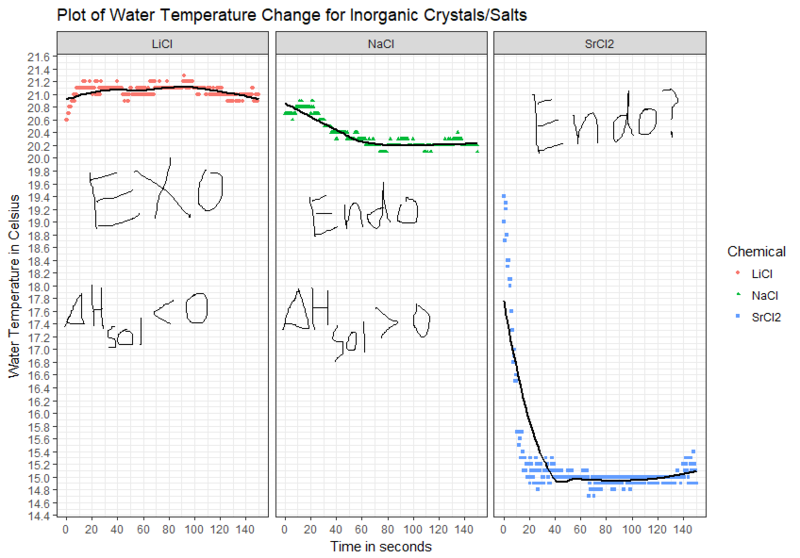 How is it that I could obtain endothermic Temperature ~ Time plots for a calculated Exothermic Enthalpy of Solution? I recently conducted a coffee-cup calorimetry experiment in which we attempted to measure if the dissolution of inorganic crystals such as LiCl, NaCl, and SrCl were endothermic or exothermic based on a change in temperature over time plot, including measure the enthapy of solutions, but I'm not sure how to do that. Methods: We measured 7.9204 grams of SrCl2, 4.2143 grams of LiCl, and 2.9290 grams of NaCl and decanted these into separate coffee cups filled with 50 mL of deionized of water. (These were about 1 - 2 mole/liter solutions.). A temperature probe measured the temperature change over 600 seconds, recording a measurement twice a second. I've only displayed about 140 seconds of the measurement, because the temperature was just continually oscillating 0.1 degree Celsius after that point as it reached equilibrium. We made plots for each of the chemicals, where an increasing curve shows an exothermic reaction, and an endothermic reaction displays a decreasing curve. Over time, these solutions (Temperature ~ Time) curves should equilibriate to room temperature. where the Lattice Enthalpy is a measure of the stability of the compound crystal which is at least a function of the charges of the cation and anion, as well as their size, and the structure of the crystal body centered cubic vs face centered cubic, and the hydration enthalpy is the energy it takes to dissolve the gaseous ions after breaking the crystal lattice. Source of Enthalpies of Hydration (Tables 1 - 2): The Enthalpies of Hydration that I've used are experimental. Smith, Derek W. "Ionic hydration enthalpies." Journal of Chemical Education 54.9 (1977): 540. ΔHsolution, LiCl = (852 kJ / mole) + [(-519 kJ / mole) + (-381 kJ / mole)] = -48 kJ / mole < 0, so this reaction should be exothermic and it is as predicted. ΔHsolution, NaCl = (787 kJ / mole) + [(-409 kJ / mole) + (-381 kJ / mole)] = -3 kJ / mole < 0, so this reaction should be exothermic. I've been searching the web about this reaction and most sources say it's endothermic which I my graph shows, but my calculations do not show that. What? ΔHsolution, SrCl2 = [2153 + (-1443 - 2 * 381)](kJ / mole) = -52 kJ / mole < 0, so this reaction should be significantly exothermic. BUT MY PLOT SHOWS that It's significantly endothermic! What's going on? Is my mathematics faulty. Am I using too concentrated solutions? Is the SrCl2 that we are using impure or not really SrCl2? I suppose that's possible, but we didn't do any validation because this lab took quite some time. How is it possible that my experiments don't match theory mostly? Thank you for you for your help. Browse other questions tagged physical-chemistry experimental-chemistry or ask your own question. How to compute the residence time for given flow rate in standard cubic meters? Why do some reactions need to be maintained at a particular temperature for prolonged periods of time?